Imagine yourself swimming in the Sargasso Sea in the Atlantic. The color blue dominates this part of the world – there’s nothing to see but a vast expanse of water and sky in all directions. The winds are calm. The water is warm, clear and deep. You have a destination in mind, but how do you choose your direction, and maintain it, day and night, for thousands of miles? Without a compass or GPS for guidance, this would be an impossible task for a human being. Yet many marine animals routinely achieve this feat during their yearly migrations between breeding and feeding habitats. Sea turtles are known for their spectacular long-distance migrations. 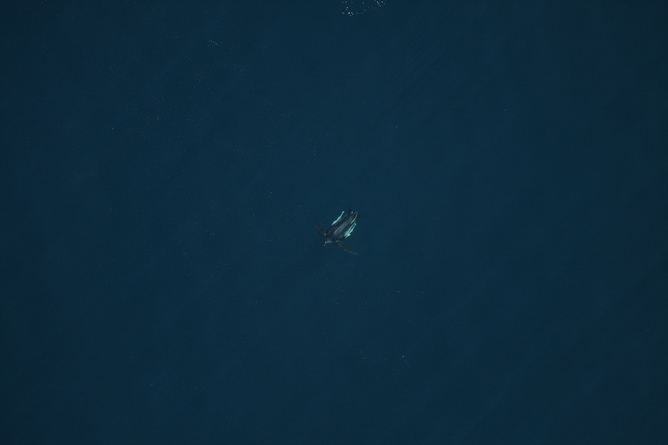 After many years at sea, they can pinpoint their natal nesting beaches after crossing entire ocean basins. We don’t know the distance covered during their developmental journeys but this period can last several decades, and they likely cover tens of thousands of miles. The largest, fastest and deepest-diving species of sea turtle is the leatherback (Dermochelys coriacea). Leatherback sea turtles can grow to over a thousand pounds on a diet of watery jellyfish. They travel extensively between tropical and temperate habitats to gorge on seasonally abundant gelatinous prey. It’s a mystery how they maintain their headings to travel direct migratory paths over such vast distances. Large Pelagics Research Center scientists collaborate with commercial fishermen to find and tag leatherback turtles at sea. Captain Mark Leach checks out a 800-pound male leatherback turtle with a GPS-linked satellite tag on its back. To understand the behavior and migratory patterns of these enigmatic turtles, we set out to locate and tag them in their northern foraging grounds in the northwest Atlantic. Productive waters off the coast of Massachusetts’ Cape Cod attract a rich diversity of marine life, including the jellyfish-eating leatherback turtle. 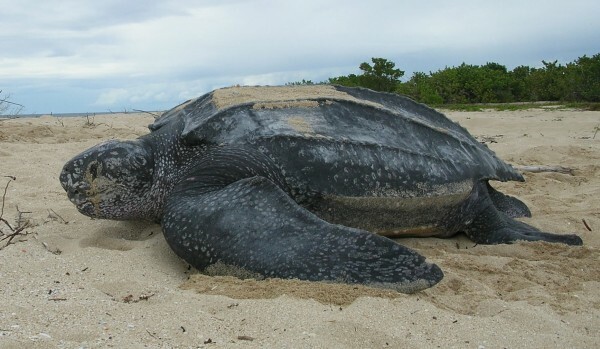 Working with a skilled team of professionals – including commercial fishermen, a spotter pilot, veterinarians and field biologists – we placed satellite tags on 20 leatherback sea turtles over three years. Satellite telemetry has revolutionized scientists’ ability to track far-ranging marine animals for relatively long periods of times (months to years), often in otherwise inaccessible habitats. 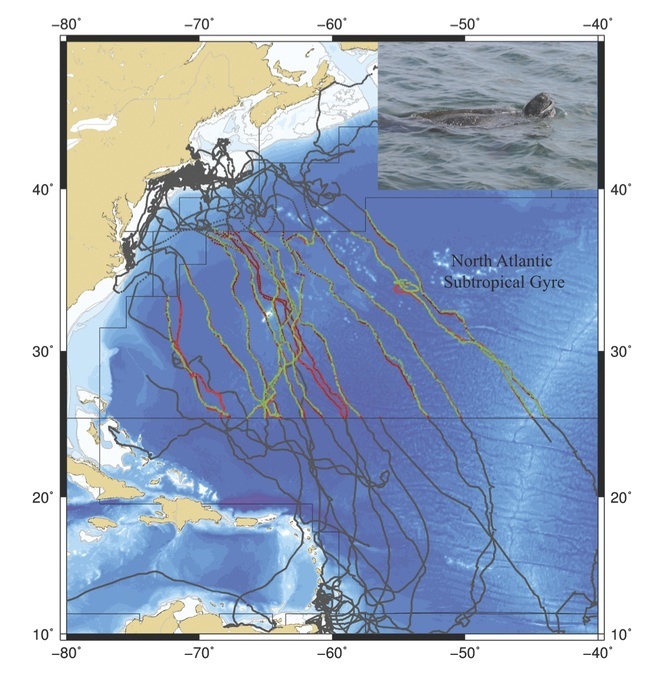 Virtually following animals via tracking tag has provided insight on migration timing and routes of a wide variety of ocean-dwelling species, including sharks, tunas, ocean sunfish, whales, seals, seabirds and sea turtles. Over the last decade, the integration of GPS antennas into traditional satellite tags has greatly improved the accuracy and precision of location data, allowing us to track migrating animals with less error. In our research off Cape Cod, we used satellite tags that collected location, depth and temperature information. When a turtle surfaces to breathe air, this data is transmitted from the tag to orbiting satellites. Satellites then relay the data to the satellite-based service ARGOS where the data is processed and then, ultimately, it’s sent to us for analysis. Somehow this young leatherback knows the way. Swimming straight ahead, but how? One goal of our study was to identify the migratory routes of male and female adult and juvenile leatherback turtles. In our recently published paper in Proceedings of the Royal Society B, we used location data from satellite tags on 15 leatherback turtles to reconstruct their tracks and analyze their migratory orientation as they traveled south to the tropics. They didn’t swim along the coast where they could use landmarks and topographic features on the seafloor to orient themselves. Instead, these turtles struck out for open ocean, swimming offshore into the subtropical gyre. The North Atlantic gyre is a large circle of ocean currents stretching from the equator to near Iceland, and from the east coast of North America to Europe and Africa. We focused our analysis on turtle movements in the middle of the gyre, in an area known as the Sargasso Sea. Map of leatherback turtle tracks. Segments in the subtropical gyre are highlighted in red (observed) and green (corrected for the effect of currents). In the deep blue realm of the Sargasso Sea, these turtles were able to maintain remarkably consistent compass headings for over 600 miles (1000 km). Individual turtles followed widely-spaced parallel paths within the gyre. It looked as if the turtles shared the same directional orientation despite being in different parts of the gyre at different times. These consistent headings suggest that leatherback turtles migrating within the gyre use a common compass sense. It remains a mystery just what that compass sense could be. Within the gyre interior, leatherback turtles have access to limited known sensory information. The seafloor is inaccessible at such depths. Weak ocean currents and lack of stationary reference points make hydrodynamic cues improbable. Wind- or current-borne cues such as odor plumes disperse rapidly over long distances. And sea turtles’ poor eyesight above water likely reduces the utility of celestial cues such as stars. They lack all these bathymetric, hydrodynamic, celestial and chemosensory modes of guidance. Stay on target, stay on target…. We hypothesize that leatherbacks migrating through the subtropical gyre may orient to some aspect of the earth’s geomagnetic field and/or the position of the sun on the horizon. Leatherbacks could have a time-compensated sun compass, similar to what has been proposed for loggerhead turtles and exists in some birds, butterflies and other animals. These animals orient themselves using the time of day from their circadian clocks and the position, or azimuth, of the sun. Solar and magnetic features are ubiquitous and vary in a predictable way from north to south in this region, making them potentially useful for compass orientation. Magnetic orientation has been demonstrated in many long-distance migrants, including monarch butterflies, yellowfin tuna, birds, sockeye salmon and sea turtles. In laboratory experiments where leatherback hatchlings were exposed to reversed magnetic field conditions in a darkened room, the turtles oriented in approximately the opposite direction, suggesting they possess a light-independent magnetic compass. If leatherbacks retain this compass into adulthood, it could explain their ability to orient consistently day and night in the gyre. Evidence for a solar compass has also been found in other sea turtles, and leatherback turtles may be able to interchangeably use magnetic and visual (solar) compasses during migration. 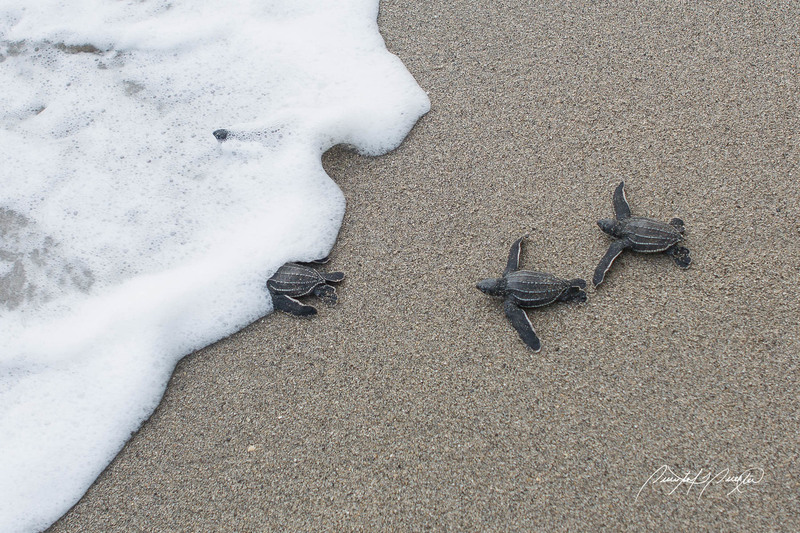 Starting out on the journey, baby leatherbacks in Trinidad. At this stage, we can only speculate on the importance of different compass senses during leatherback migration. But there’s no doubt that adult and juvenile leatherback turtles are capable of remarkable compass orientation in the seemingly featureless expanse of the Sargasso Sea. How they actually accomplish these feats remains a mystery, but our study provides some tantalizing clues. Future work should focus on understanding the sensory systems that allow leatherbacks, and other ocean navigators, to find their way across the open sea.